An early exit on home soil in Germany when the top seed, later in the year a similar scenario in both the Korea Republic and in Australia; once again on Friday 17th August at the Seamaster 2018 ITTF World Tour Asarel Bulgaria Open in Panagyurishte, there was disappointment for Dimitrij Ovtcharov. Once more the name at the head of the list, he was beaten in six games by China’s Zheng Peifeng (11-9, 8-11, 11-7, 11-8, 9-11, 11-6). The end of the road for Dimitrij Ovtcharov against Chinese opposition, it was the same for England’s Liam Pitchford, the sensational winner the previous day against Ma Long, he experienced a second round reverse at the hands of Ma Te (11-7, 11-7, 11-7, 8-11, 11-7). Defeats for two notable names but for arguably the most notable, owing to the longevity of his career, Vladimir Samsonov of Belarus, the no.10 seed, accounted for Chinese Taipei’s Chuang Chih-Yuan, the no.6 seed (11-5, 11-4, 11-7, 12-14, 11-5) to book his third round place. 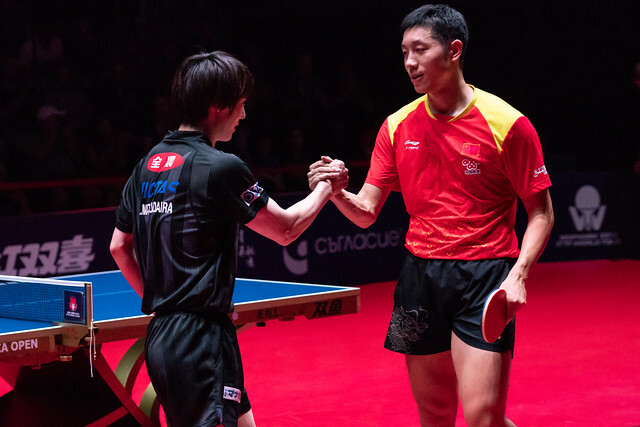 Success contrary to current status for Vladimir Samsonov; conversely for China’s Xu Xin, the no.2 seed and now the favourite for gold, it was success as it was for Japan’s Tomokazu Harimoto, the no.4 seed. Xu Xin overcame Japanese qualifier Yuya Oshima (11-4, 9-11, 11-7, 8-11, 6-11, 11-8, 11-5); Tomokazu Harimoto ended the hopes of Frenchman, Emmanuel Lebesson, the no.13 seed (11-7, 11-7, 11-7, 8-11, 11-7). Meanwhile, in the Women’s Singles event, the first two semi-finalists were decided. Japan’s Hitomi Sato, the no.4 seed beat Hungary’s Georgina Pota, the no.13 seed (11-9, 11-5, 11-5, 11-7), to reserve her penultimate round place; likewise China’s Wang Yidi accounted for colleague and fellow qualifier Liu Xi (11-9, 11-5, 7-11, 9-11, 11-8, 9-11, 11-6). Notably in the opposite half of the draw where the quarter-final matches have still to be played; Japan’s Kasumi Ishikawa, the top seed and defending champion, beat Romania’s Bernadette Szocs, the no.12 seed (8-11, 11-7, 11-8, 11-9, 11-1). Similarly there was second round success for colleague Miu Hirano, the no.4 seed as there was most significantly for China’s Ding Ning, the reigning Olympic and World champion. The no.6 seed, in the second round of proceedings, Ding Ning beat colleague Wen Jia (11-6, 11-8, 11-8, 14-12); Miu Hirano accounted for German qualifier Nina Mittelham (11-2, 11-2, 11-4, 11-4). Matters approaching the later stages, in the Men’s Doubles and Women’s Doubles events, the finalists are known. 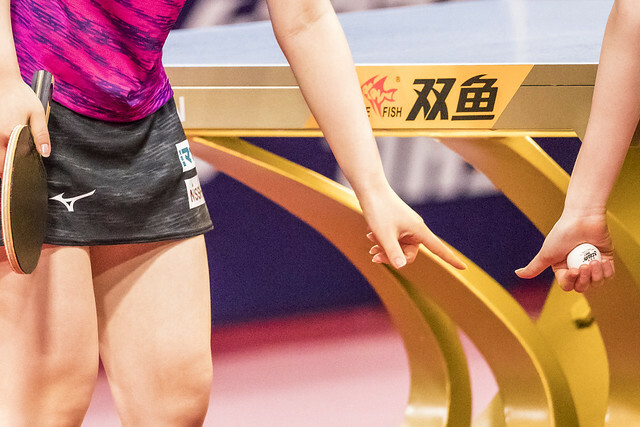 In the former Japan’s Masataka Morizono and Yuya Oshima, the top seeds, meet China’s Ma Long and Xu Xin, the no.2 seed; in the latter Kasumi Ishikawa and colleague Mima Ito, the no.2 oppose Chinese qualifiers Liu Gaoyang and Zhang Rui. The remaining quarter-finals of the Women’s Singles event plus the semi-finals will be played on Saturday 18th August, as will the Men’s Singles last eight and penultimate round matches.